Découvrez les Blue Ridge Mountains au sommet de la montagne Bent. Vues de la vallée de Roanoke et de la Blue Ridge Parkway, qui s'étendent sur 160 km. Des kilomètres de sentiers de randonnée et de chevaux se trouvent juste derrière votre porte. La cabine fait partie d'une ferme de 450 acres et très privée offrant un cadre montagnard serein. Meublé avec des antiquités d'époque et des draps et des draps de luxe. Installez-vous confortablement devant la cheminée en pierre extérieure et allongez-vous pour regarder les étoiles. À seulement 25 minutes des restaurants raffinés, des divertissements et de l’aéroport régional de Roanoke. Le tarif ne comprend pas les frais de nettoyage de 100 $. loved this place. the location. the views. the uniqueness and total comfort of the cabin. the trails, outdoor fireplace and the pond. a small piece of heaven. selfishly, hate to let others know how great it is but it is. My wife and I enjoyed the weekend on top of a mountain, secluded from job stress, commuting and all the trappings of our electronic devices. 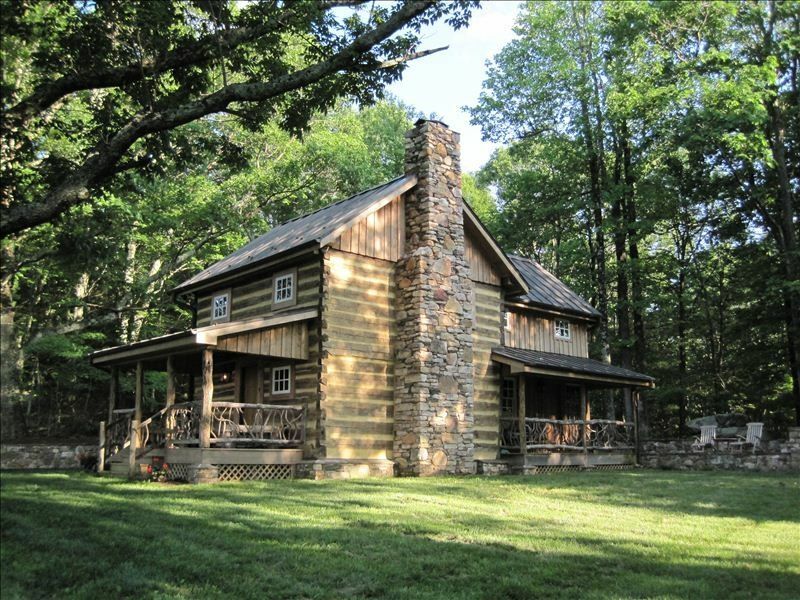 The authentic log cabin has the feel of a life long ago with all the modern conveniences. We enjoyed cooking outdoors, sitting at the outdoor fireplace and listening to nature beginning to wake up this spring. The bed was so comfortable and all the furnishings inside were well appointed which made the stay very cozy, warm and relaxing. Thanks for the use of your home- the view looking down on Roanoke and seeing the mountains at dawn and at night was worth the trip. Our family of four really enjoyed out week at the Overlook Cabin. The cabin is beautiful and the kitchen was fairly well stocked. Because the cabin sits on 400 acres, we never saw anyone else until we headed down the mountain. Great hiking! I agree with everyone else about the groceries - the closest grocery store is 20 minutes away, so you need to plan. Jim and Ellen M.Arlington, va. Overlook cabin ....one of our very favorite places. It is peaceful, lovely, and completely provided..... linens are luxurious, the kitchen has everything you could possibly need. The view is amazing. Best of all...you can detach from devices...,and enjoy being with each other...friends, family. We visited 11/26-11/29, after the Thanksgiving holiday. This was our third stay there. The owners and the cabin are always most welcoming We saw wildlife...deer, wild turkeys and a bear, too.......there had been an ice storm which damaged some of the trees and there were so many varieties of woodpeckers on downed branches. There was a brief snowfall one evening and we discovered that there is something unique and lovely about being in a cabin in the woods, looking out at the snowfall. We think Overlook cabin is perfect....highly recommend. The cabin is just beautiful; it can be describe as simple and rough -rustic, yet it is also polished, sophisticated and elegant. If you love nature and want to feel you are far from society this is the perfect place (but still only a few minutes from town). The owners are also so just so nice, friendly and helpful. I definitely would love to go back!